To that end, Mr. Trudeau turned the microphone over to SIS students to pose questions in an eagerly anticipated live and unscreened Q&A. Questions ranged from how he might stem a rise of hardliners in Canada to a humorous inquiry of whether or not Canada was prepared for a large influx of American immigrants depending on the outcome of the 2016 presidential election. Students asked about relations with indigenous peoples and international collaboration around space travel, and Mr. Trudeau responded to questions about ISIS, about compassion, and about not using politics to incite tensions. The session was sprinkled with pop culture references from Star Trek and Game of Thrones, shout-outs to feminism, and a plea from the Prime Minister for more men to join the ranks of feminists. Anish Babu Bharata, a first year master’s student in the Global Governance, Politics, and Security program who attended the discussion, admired the Prime Minister’s progressive stance. In his opening remarks, Dean James Goldgeier referenced Mr. Trudeau’s groundbreaking cabinet, evenly split between men and women—after all, as the prime minister quipped, “It is 2016”. The dean also lauded Mr. Trudeau’s humanitarian move to accept 25,000 Syrian refugees on a rapid timetable. Mr. Trudeau’s talk at SIS comes at the end of a whirlwind first official visit as prime minister, the morning after a state dinner during which he and President Obama struck a neighborly tone throughout. The event at SIS was an extremely hot ticket despite occurring during spring break, with all seats filled within 20 minutes of the announcement. In addition, more than 2000 people watched the livestream, which can be streamed here. 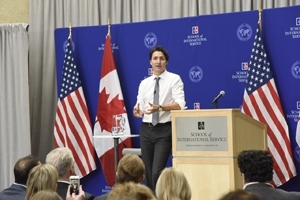 See highlights from Mr. Trudeau's visit to SIS here.